View More In Paella Pans - Page 4. 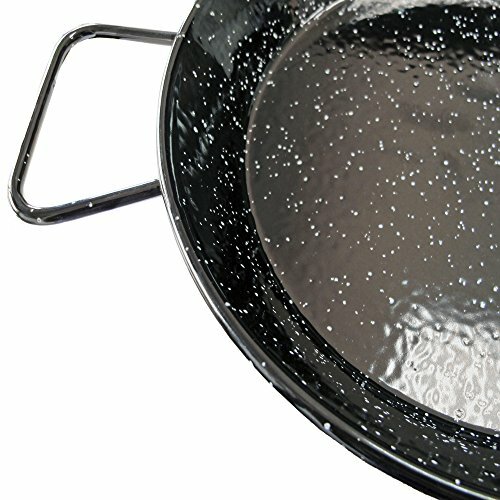 11 inch Enameled Steel Paella Pan (28 cm)This 11" pan serves one person generously and two people moderately. Fits over one burner. Enameled pans offer convenience and value, and they make delicious paella. Made of steel, they're coated with a black and white speckled enamel, so rusting will not be an issue. The enamel also makes them a bit easier to clean, even if you've managed to get a good layer of socarrat (caramelized rice on the bottom of the pan). PAN DIMENSIONS: Bottom Diameter: 9", Top Diameter: 11", Diameter w/ handles: 14.75", Depth (outside): 1.5"
Requires no special maintenance. Easy to clean and will not rust. Safe for use on the stovetop, in the oven, or on a grill. Ideal for serving 1 to 2 people. The pan comes with an informative pamphlet that contains two recipes, tips for perfect paella, and care instructions.